Credit northern Idaho for electing to Congress some of the nation's most notorious fiscal tightwads - Steve Symms, Larry Craig, Helen Chenoweth-Hage, C.L. (Butch) Otter, Bill Sali and Raul Labrador. And they followed up with jeering the loudest against the usual suspects of federal waste - whether it was paying $435 for a hammer, $600 for a toilet seat or $7,000 for a coffee pot during the Reagan era. For some, it was the late Sen. Ted Stevens, R-Alaska, pouring nearly $400 million into a bridge linking 50 residents of Gravina Island to the town of Ketchikan - famously dubbed the "Bridge to Nowhere." For others, it was the king of congressional pork, the late Sen. Robert Byrd, D-W.Va., spreading $1.5 billion on his "Corridor H" project, otherwise known as the "Highway to Nowhere" because it stops 10 miles short of the Virginia state line. How many of your own neighbors railed against the Obama administration allocating $500 million to the solar cell manufacturer Solyndra - only to have the company file for bankruptcy and fire all its employees? You yourself may have grumbled at least a bit about the White House backing a $2.85 billion "cash for clunkers" plan that did nothing more than encourage people to buy new cars a little sooner than they otherwise would have. So imagine what someone from Tupelo, Miss., Galveston, Texas, or even Red Bank, N.J., might think if he had read Eric Barker's recent Tribune profile of former Army Corps of Engineers Deputy District Engineer Jim Waddell. As Waddell told Barker, he was skeptical 15 years ago that his agency had accurately weighed the relative costs and benefits of maintaining the four dams on the lower Snake River vs. breaching the structures. Rehabilitating all 24 turbines at the four dams would cost $776 million - more than twice what the corps expects. Operating and maintaining the dams - on average - would cost $217 million a year, or $160 million more than the corps figured. Waddell next expects to scrutinize how the corps scored the benefits these dams deliver - but recent headlines would suggest he's likely to find the operations produce far less than projected. For instance, container shipping volume at the Port of Lewiston is down 80 percent during the last two decades - as companies turn to transportation options that will give them access to markets back East or to the Port of Seattle. It's likely to drop even further in light of Hanjin Shipping plans to withdraw service from the Port of Portland on March 9. The dams generate about one-third of their hydropower capacity while the region has more than replaced that amount of power through wind turbines. Not only would enraged taxpayers zero in on Waddell, they may recall another former insider who emerged as a critic. Until a decade ago, fisheries biologist Don Chapman was employed by the Northwest's electric power utilities to defend the dams. 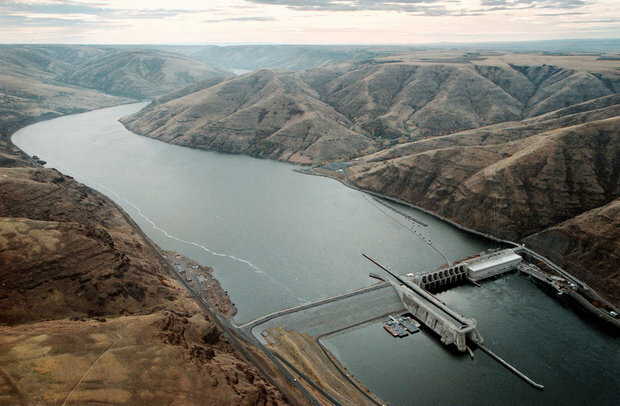 Once retired in 2005, Chapman changed his tune - contending that with global warming, Snake River salmon would not survive unless the dams were breached. Deep in debt, the federal government has only so much money to update aging ports and waterways - not to mention providing water storage in response to climate change. How long will it take before people hungry for limited federal infrastructure dollars begin asking why money is being lavished on an inland navigation system that is so seldom used it fails to meet the corps' definition of a "negligible use" waterway? They might even turn the tables on us by naming it a "Port to Nowhere." Will Taxpayers Dub It A 'Port to Nowhere'?